Despite being a Toy dog, the breed is very active. Griffons usually have no trouble whelping on their own, but sometimes complications can cause a Caesarean section to be needed. The size of a litter is typically 1-3 puppies. The size of the litter often determines the extent of these complications. Litters of six are not unheard of. When they are born, the puppies only weigh but a few ounces and are small enough to fit in the palm of an adult's hand. It can get leg and heart problems from an early age. Lacerations - Lacerations are a common issue amongst the breed. Because the Griffons have such large eyes and a short snout, there is very little there to protect their vision from foreign bodies. If a laceration is left untreated it can result in blindness. Cataracts - As with most breeds, cataracts are a common problem as the dog ages. For many breeders it is a disappointment that the cataracts typically develop long after the dog has already been bred. Glaucoma - Glaucoma can also be a common issue amongst Griffons due to the breeds facial features and eye size. Although Griffons have a shortened snout, heat stroke is not a major concern for them as it is with other flat-faced breeds. The breed's shortened muzzle may cause respiratory issues in extreme heat but overall they tolerate both hot and cold weather well. As with any breed, owners must use common sense and not leave them outdoors without protection from the elements or subject them to rigorous exercise during extreme temperatures, so let them in your house for cool air and some water (ice cold water is bad for dog's stomachs). Syringomyelia (SM) is a condition affecting the brain and spine, causing symptoms ranging from mild discomfort to severe pain and partial paralysis. Syringomyelia is characterised by fluid filled cavities within the spinal cord. SM occurs secondary to obstruction of cerebrospinal fluid (CSF) especially if that obstruction is at the foremen magnum. To date the condition has been also reported in Cavalier King Charles Spaniels, King Charles Spaniels, Yorkshire Terriers, Maltese Terriers, Chihuahuas, Miniature Dachshunds, Miniature/Toy Poodles, Bichon Frisé, Pugs, Shih Tzus, Pomeranians, Boston Terriers, French Bulldogs, a Pekingese, a Miniature Pinscher, mixbreeds, and a couple of cats. 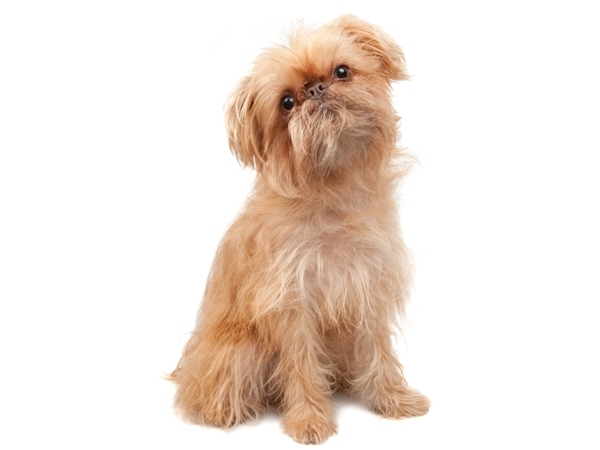 The three variations of this dog, the Brussels Griffon (Griffon bruxellois), the Belgian Griffon (Griffon belge), and the Petit Brabançon, all descend from an old type of dog called a Smousje, a rough coated, small terrier-like dog kept in stables to eliminate rodents, similar to the Dutch Smoushond. In Belgium coachmen were fond of their alert little Griffons d’Ecurie (wiry coated stable dogs) and in the 19th century, they bred their Griffons with imported toy dogs. Breeding with the Pug and King Charles Spaniel brought about the current breed type, but also brought the short black coat that led to the Petits Brabançon, which was originally a fault in the breed. The spaniels also brought the rich red and black and tan colour of the modern Griffon Bruxellois and Griffon Belge. Brooklyn, a Petit Brabançon puppy.